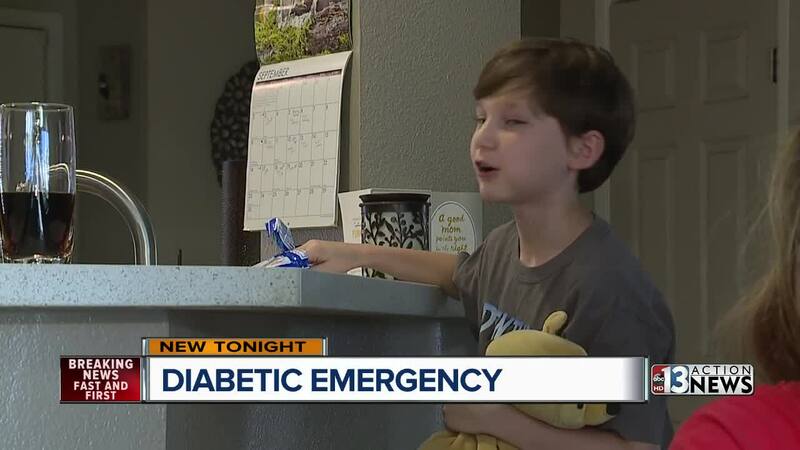 A panicked mom calls for help for her diabetic son but says the dispatcher did not ask some important and potentially life-saving questions. Tina Cabrales-Stevens says the trouble started earlier this month after her son, Kale Stevens, 9, had woken her up around 10:30 p.m.
"He came banging on my door and said he was at 62 and going down fast and felt like he was going to vomit," explained Cabrales-Stevens. According to the Mayo Clinic , a normal blood sugar level in a non-diabetic person can range between 70 and 140. Kale's blood sugar level continued to drop no matter how much he ate or drank, according to Cabrales-Stevens. "We were dropping and we were at 45 and dropping and it was not coming up,"added Cabrales-Stevens. "I was shaking and I felt like I wanted to throw up," said Kale. The repeated scans of Kale's wearable blood sugar monitor revealed a dire situation. His blood sugar was so low it failed to give a reading. "I was panicking, his eyes were rolling in the back of his head, he was uncontrollably shaking," said Cabrales-Stevens. After a few terrifying moments, Cabrales-Stevens broke out an emergency glucagon shot, which is designed to boost blood sugar in a hurry. "I gave him the glucagon shot and in the meantime I called 911," said Cabrales-Stevens. Thoughts began to race through Tina's mind about her son while on the phone for help, but she says, upon reflection, she was never asked from basic questions by the dispatcher. "Do you have a glucagon kit on hand? Is your son on an insulin pump, does he take [insulin] shots?" wondered Cabrales-Stevens. A spokesperson for Las Vegas Fire and Rescue says the call was professionally and appropriately handled. Call takers use a computer program called "PRO Q A" and it has a series of questions designed by doctors to give medical advice before paramedics or emergency medical technicians arrive. The spokesperson says a review of the call shows there was nothing else the dispatcher could have told Cabrales-Stevens. "When the EMTs arrived he told me about four times that I did a great job and most parents panic and do not use a glucagon kit because they panic," said Cabrales-Stevens. Las Vegas Fire and Rescue says they are always willing to take suggestions on how to handle similar emergencies. Cabrales-Stevens wants a step-by-step checklist provided to 911 call takers to make sure this does not happen to another family. Kale was treated by medical personnel and his blood sugar returned to safe levels once again.